The Christmas gift giving season will be over as well as Saint Charlemagne's Day (January 28th), but on March 15, 2010, afficionados of all things Charlemagne will have something new they simply must acquire. 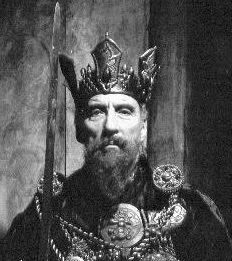 That is the date when a CD entitled Charlemagne: By the Sword and the Cross will be released starring the vocals of Sir Christopher Lee. Lee's official website has four samples of songs from the forthcoming CD as well as a link to an official fan page on MySpace to promote the CD. After looking at the table of contents, it is clear that the music is based on the man and not the legends of Charlemagne, so there will be no odes to his paladins such as Orlando or Renaud de Montauban. Instead, you can hear Christopher Lee proudly singing, "I shed the blood of the Saxon men!" Here is a video where Lee talks about the CD and his being descended from Charlemagne. The music is described as "symphonic metal." It is a CD about Charlemagne, sung by a descendant of Charlemagne. Of course it will sell. Excellent. I like Christopher Lee. This is the first I've heard about the CD. I'm glad my blog can be a source of useful information. The CD should be a hoot! Ah, Sir Christopher is a descendant of Charlemagne! Well met. That explains a lot. Perhaps he'll read for the metal version of your book. We can read/watch/listen/interact with the iPad edition.